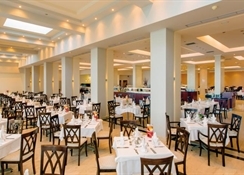 Built in a modern style combined with traditional architecture typical of this island- this air-conditioned hotel comprises a total of 285 rooms. A bar- a small supermarket- a TV room- a conference room- a currency exchange counter and a restaurant are all available for guests to make use of. Younger guests may let off some steam in the playground and a laundry service is on offer. There is a car park for guests arriving by car.